12 D I V E R S I T Y W O M A N S p r i n g 2 0 1 8 d i v e r s i t y w o m a n . c o m Anatomy of a … Pay Raise Get the Salary You Deserve ACCEPT—FOR NOW. "What if you get no as an answer?" says Marinelli. "Be ready to accept that, but also keep showing your value, and revisit the issue a little further down the road. No doesn't mean never!" Upfront > ISTOCKPHOTO Y OU'VE BEEN A STELLAR em- ployee for the past year. You've exceeded your goals and your midyear performance review was glowing. Now comes the hard part—making the case for a significant pay bump, not just a cost-of-living raise. RESEARCH comparative pay rates for your position. Websites like Glass- door collect this information for a number of sectors. Be aware, however, that these figures are just guidelines, and they can vary greatly by region and company. Also, discretely network and find out from your peers at other companies what is considered the market rate. ASSEMBLE a written docu- ment and a verbal pitch detailing ev- erything you have accomplished over the time pe- riod. Chances are that your supervi- sor, who man- ages a number of employees, won't remember all your achievements. FOCUS on how you have helped the company. "I don't advise focusing on longevity or on how you've improved your skills," says Kelly Marinelli, principal consultant, Solve HR Inc., and member, SHRM Talent Acquisition Special Expertise Panel. 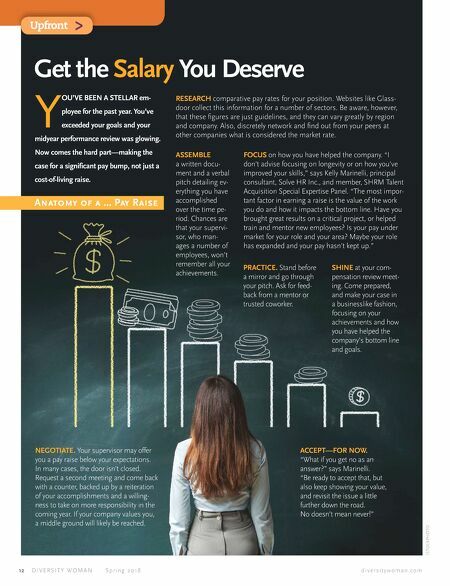 "The most impor- tant factor in earning a raise is the value of the work you do and how it impacts the bottom line. Have you brought great results on a critical project, or helped train and mentor new employees? Is your pay under market for your role and your area? Maybe your role has expanded and your pay hasn't kept up." PRACTICE. Stand before a mirror and go through your pitch. Ask for feed- back from a mentor or trusted coworker. SHINE at your com- pensation review meet- ing. Come prepared, and make your case in a businesslike fashion, focusing on your achievements and how you have helped the company's bottom line and goals. NEGOTIATE. Your supervisor may offer you a pay raise below your expectations. In many cases, the door isn't closed. Request a second meeting and come back with a counter, backed up by a reiteration of your accomplishments and a willing- ness to take on more responsibility in the coming year. If your company values you, a middle ground will likely be reached.